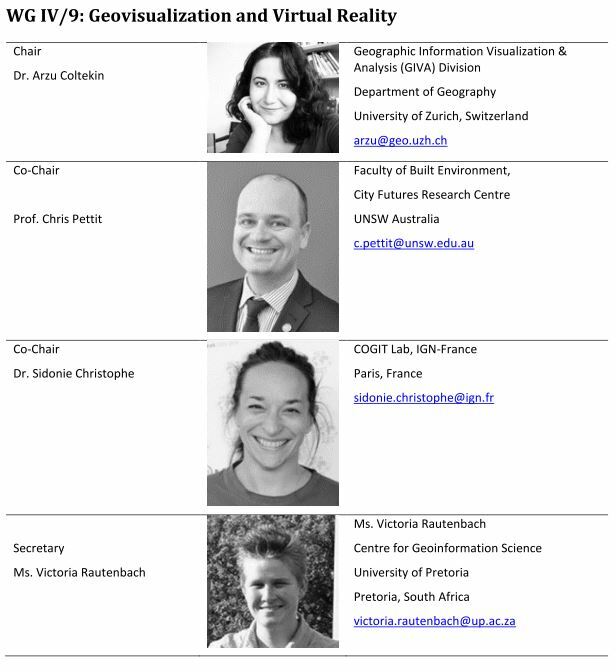 Name change: Our commission (Spatial Information Science) is now Commission IV, and our working groups is WG IV/9. We also modified the name of the WG slightly, and now we are called “Geovisualization, Augmented and Virtual Reality“. Team change: We also have some changes in our team. Our past co-chair Dr. Bo Wu decided to step down from the executive committee but remains an active member. We are thankful for Bo’s executive contributions for the last two terms. For the new term, we warmly welcome Dr. Sidonie Christophe of IGN, who is also a co-chair at the ICA commission on Cognitive Visualization. We are looking forward to collaborating more on cognitive and human centered issues. Furthermore, myself and Dr. Chris Pettit have swapped hats (chair <–> co-chair) and I will chair the group for the next four years, while Chris remains actively involved as a co-chair in our executive team. Victoria also continues for another term in her role in our executive team. We are excited to build a community around the topics of (human-centered) geovisualization, augmented and virtual reality. If you wish to collaborate with us, please become a member, and if you wish to organize activities (workshops, special issues and such) under our WG’s umbrella, please drop as an email and we’ll have a conversation. You will find our ‘terms of reference’ below the image.